So, I now have two Amazon Bestsellers... from nowhere to here in just over two years. I've been thinking about how I did it and have come up with these ten top tips for writing a successful book as I realise there are a lot of you out there thinking 'I wish I could do that' - well you can! Just follow this ten step recipe and you have every chance of joining me or maybe doing even better. Build an author platform (website, blog and social media) with a newsletter sign up to build your fan base. Get a great cover that is appropriate for the genre of your book. Edit the hell out of it until it's pretty much perfect. Write an enticing blurb that grabs your audience. Pick relevant but not over popular keywords for your Amazon book search. Invest in paid and free advertising at least for your launch week but longer if it goes well. I hope you had a wonderful Christmas and enjoyed 'merry' New Year Celebrations with friends and family. Hopefully, you have already started planning lots of great things to do next year - holidays, get-togethers with friends, and maybe ticking a few things off your bucket list? 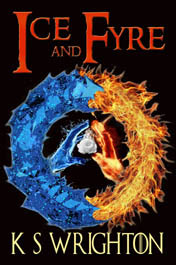 For me this year will see the publication of Ice and Fyre - the last of the Afterland Chronicles. The provisional release date is 7th April 2017. On Monday, I shall be back at work writing away like mad in my little snug by the wood burner in an endeavour to complete the first draft by the end of the month. I am feeling the pressure to make Ice and Fyre extra special now that Ascension of the Whyte has been such a success - an Amazon Number One Bestseller for the last four weeks! My aim is to make the trilogy one of the few where the third book is as good or even better than the first. Happily, the feedback I have been getting on Ryte of Passage is reassuringly positive with many people commenting that it is better than book one! If you have read Ascension of the Whyte, Ryte of Passage or The Last Girl Guide and would like the opportunity to win a signed paperback copy of Ice and Fyre when it is published in April, then all you have to do is to post a review of any or all of the three books on Amazon. All reviewers will automatically be entered into the free prize draw and two lucky people will receive a signed copy. If you have already reviewed any of the books then you are already entered! Every review counts as a single entry, so you can enter three times if you have read all three books. Entry is based purely on the review being posted and not on the content of the review so, please be honest. 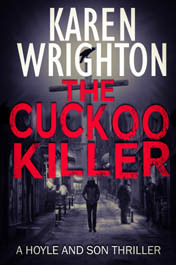 Later this year will also see the publication of the first of The 'Hoyle and Son' Mystery Thriller series - The Cuckoo Killer. The book is still in the outline stage of production, but I am enjoying doing the research as the series is going to be set in and around Norwich. I am playing around with the idea of having a thriller series with a supernatural edge. I would love to know what you think of the idea.